In Cookeville for a gymnastics meet, I decided to slip out early while the rest of the crew was still sleeping and grab a waterfall or two. In this case my primary target was Waterloo Falls. 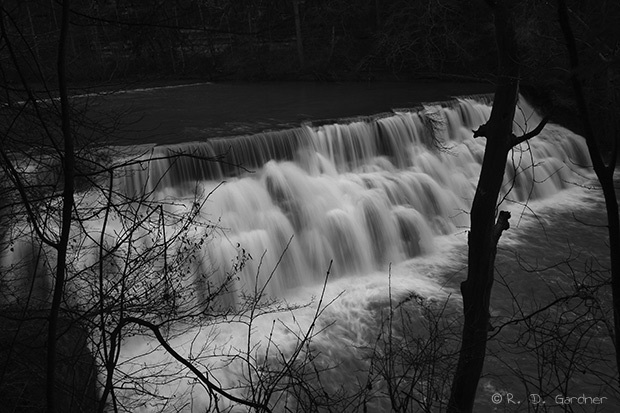 The waterfall is located next to a gravel road and only about 15 minutes north of Cookeville, TN. Probably a popular spot in the summertime but this particular morning I had it all to myself. The colors were dull so I decided to just convert all my photos to black and white. The waterfall is very wide but not particularly tall. 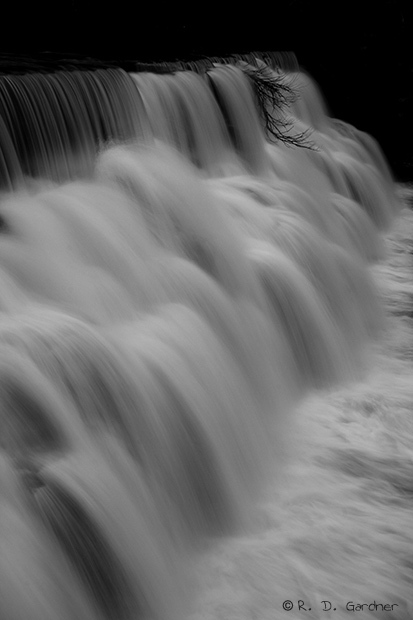 In fact the waterfall could pass for an old, deteriorated dam due to its width and uniform nature. Enjoy. Head north out of Cookeville on Highway 136. About 10 miles out of town the highway will turn sharply right. In this turn continue straight onto Waterloo Rd. If you cross the bridge on 136 you've missed your turn. Go back. After turning process across the creek and turn left onto the dirt road, Virgil Murphy Circle. Continue to the parking area next to the creek and waterfall. 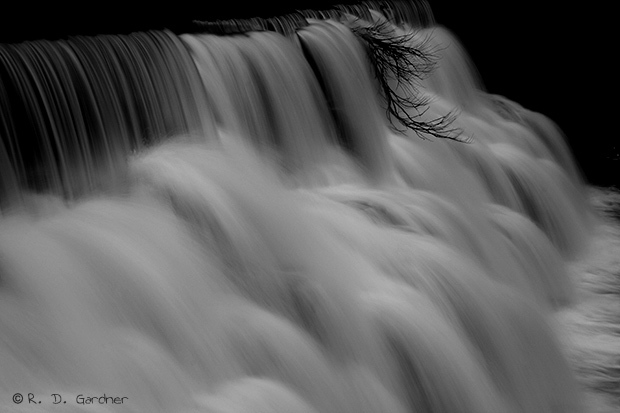 You can also use the following link to customize your own directions to Waterloo Falls. No hike. You can drive up to this one. First, keep in mind the conditions when I was there. It was early - really early - about 0630 in mid-March with overcast skies and a drizzle at times. There were no leaves on the trees or bushes so color was at a minimum. In fact I decided to convert my pictures to black and white because the original color was poor. I like the black and white much better. So I had some good things going on and some not so good things going on. Your options on composition are limited by the terrain so you'll have to make do. As always I recommend the use of a polarizer to cut down on reflections. I did a little sharpening and color conversion with Photoshop but that is all. 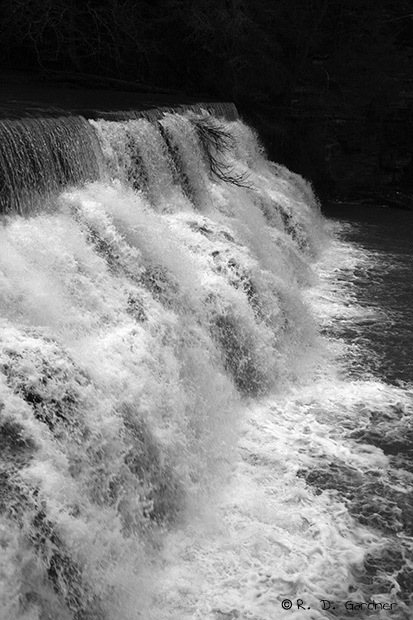 You'll need a wide-to-normal zoom lens here in the 18-55 mm range because of the proximity to the waterfall and its size. Play with shutter speed. Look at the two vertical pictures on the left and see the effect that shutter speed will have here. Pick your preference and have at it.